The transformative focus for veterinary practice involves understanding that a primary driver of veterinary success is knowledge dissemination. Focusing on knowledge dissemination as an added purpose of the successful veterinary practice is transformative because the result is a relationship with a client, not just an animal that has been restored to health. 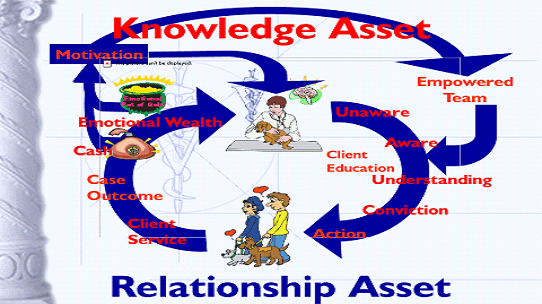 Once the veterinary knowledge asset has been used to create a client relationship, maintenance of this relationship becomes essential to the long-term health of the veterinary practice. This causes an evolution of the definition of a successful veterinary practice from a “veterinary centered practice” to a “client centered practice.” When the client becomes the center of the practice, customer service rises in importance and the need for health care team members to serve in this function rises. Client relationships can be maintained and increased as the veterinary knowledge asset passes through the health care team to the client. Client education becomes more of a function of the team than just the veterinarian. The educated client uses more of the veterinary services than the non-educated client thereby increasing the size of the “veterinary pie”. 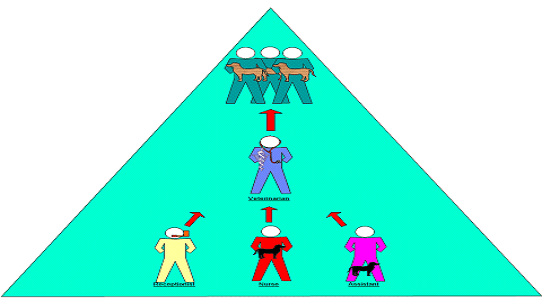 The guiding principle should be “he who has the smartest client – wins”. Never before has the demand for the “human-level” care of pets been so high and never before has the science and technology of the profession been so capable of providing this level of care. These competing commitments that occur between seeing more clients and doing an excellent job with each client create stress, and occur because our capacity to share our knowledge is limited by our own veterinary face-time. Veterinary face-time is the time that a practitioner spends one-on-one with each client sharing knowledge about the proper care for his or her pet. Veterinary face-time is the most valuable commodity in a veterinary practice. VetPlanä helps increase the effectiveness of veterinary face-time with clients, as well as the amount of “team face-time” through employee empowerment. Historically, the veterinarian’s knowledge was shared with the farmer who may have cared for many animals enabling the veterinarian’s knowledge to be magnified across the whole herd or flock. Today, the veterinarian’s knowledge is shared with one or many family members who may be working together to care for a single pet. The veterinary team uses a knowledgebase (VetPlan) to support the knowledge of the veterinarian. This veterinary knowledge is first disseminated through the veterinary team of receptionists, assistants and technicians who help the veterinarian support the clients to a new level. Today’s veterinary client is more educated and has higher expectations – is in fact, more demanding – than ever before, and the typical pet has become a part of the family. People who own pets expect human-level care for their pets and are willing to pay for it. Pet owners want their practitioner to not only provide medical care for their pets when their pets are ill, but also want and need information regarding behavior, training, nutrition, preventative medications, preventative diagnostics, and other social aspects of pet care. Today, the veterinarian’s knowledge is shared with one or many family members who may be working together to care for a single pet. The veterinary knowledge is first shared with the team who then assists the veterinarian in communicating this knowledge with the client who in turn cares for the pet. VetPlan is a knowledge management system that enables the health care team to participate in the sharing and communication of veterinary knowledge with the client during all steps of the client interaction. The more knowledgeable client makes better choices for and takes better care of their loved ones. Value of a veterinary practice is determined by the knowledge within that practice and how well the knowledge is managed. In the traditional veterinary practice, the veterinarian is the repository of knowledge and is therefore the creator of wealth in the practice. The veterinarian is also the bottleneck in delivery of knowledge. There are only so many hours in a day for the veterinarian to see clients and attend to their pets. Veterinary practice is therefore constrained by the capacity of the veterinarian to communicate his/her knowledge in the service of a client or pet. 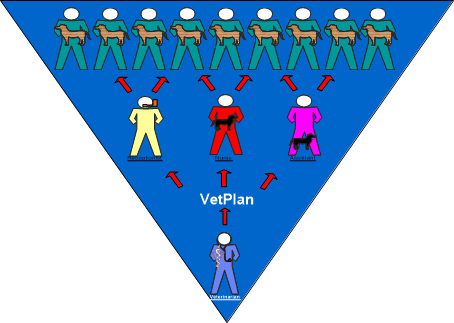 VetPlan enables duplication and management of the veterinary knowledge asset so the entire health care team can participate in knowledge sharing. Once the capacity to share knowledge is increased, the veterinary practice will build wealth at a higher level.